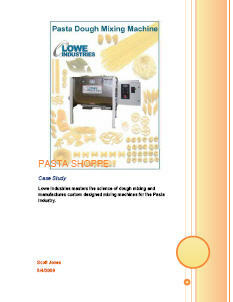 During the development of the pasta dough mixer design, Lowe consulted with industry expert Carlo Varesco. Mr. Varesco has worked within the US pasta industry for over 45 years. Together Lowe and Carlo designed and built a portable test mixer for use by prospective customers. Based on Pasta Shoppe’s application requirements, the test mixer was modified with the appropriate configuration of agitator, liquid addition spray manifold system and integral control panel. A free trial mixer was scheduled and shipped to the Pasta Shoppe plant in Nashville, TN for a 3-week test. “The key to success for the Pasta Shoppe product application involved our learning the pasta dough making process. We first had to understand how the semolina flour absorbs water, learn about its granulometry and discover how to provide sufficient hydration during the dough making process even before we set out to design the equipment,” commented Evans. To accomplish this, our team did some lab testing to better understand how our equipment would complement the science of dough making,” added Evans.